**Product received for review. All thoughts and opinions are 100% my own. With Easter just around the corner, there has never been a better time to really start teaching your little ones about Jesus... but where do you begin? How do you teach even the smallest of children the true significance of Jesus in a way that they can understand? Books, dvds and Sunday school classes are all great of course, but how much are they really understanding and relating to? 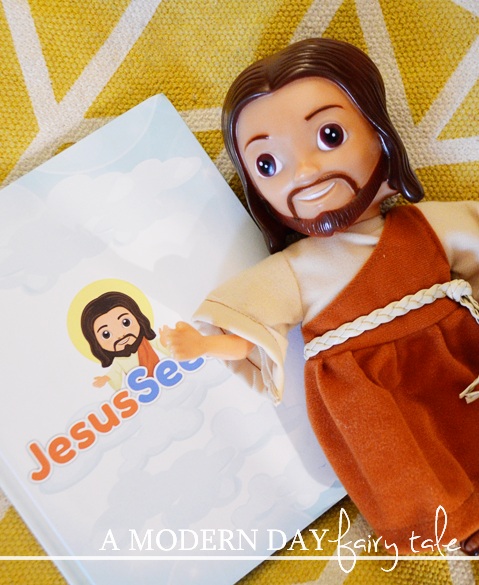 Faith based Jesus doll and book for children. Jesus Sees Us is a beautifully relatable tool for introducing Faith, Jesus and His teachings into your child's life. Imagine your child took the same interest and wonder in Jesus and the Christian message as they did in princesses, fairies and elves? 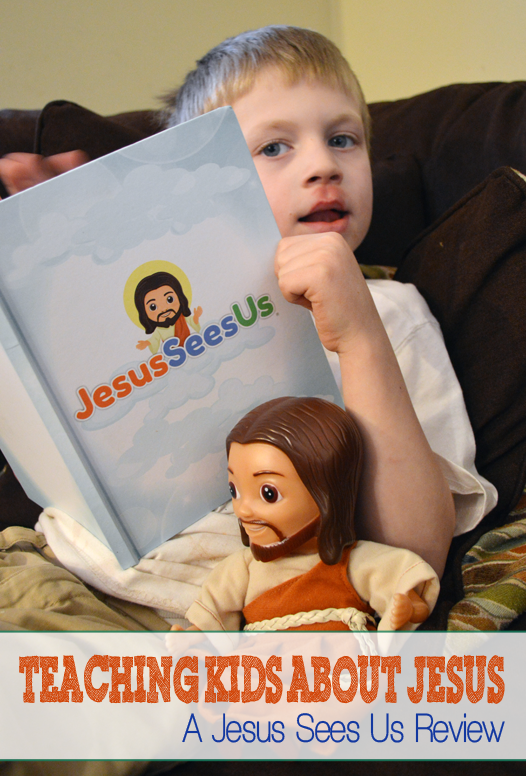 The Jesus Sees Us doll and accompanying book are tools to assist you in engaging your child and starting the conversation with them about Jesus' teachings. Sounds pretty genius, right? I could not wait to have my kids try one out! The first thing I noticed when I opened our package was that it's super cute...much cuter in person. I think! The Doll has a warm and loving face and inviting, open arms that mirror the image of the illustrations in the Lesson Book. My daughter couldn't wait to get her hands on it! It was soft, and friendly looking- and the perfect size for her small hands! She has loved playing with her 'Esus'. My son on the other hand was all about the book! He loves Bible stories and learning about Jesus, but those stories are not always easy for him to translate into his every day life. This book however gives him real life examples of just how he can act like Jesus. Seeing this friendly face in both the stories and the doll, Jesus became much more relatable. He didn't seem like a figure who was unattainable, but a true friend who is with us in our day to day life. Even as adults, couldn't we use that little reminder? This is ideal for kids age 2-6, but both my under two and over six year old loved it as well! If you're looking for a great way to encourage your little ones to have a meaningful relationship with God, this is a must see! Truly, the perfect addition to any Easter basket! You can learn more at JesusSeesUs.com. Ready to buy one for your child/grandchild? They are available to purchase at Amazon using this link, and you can save $10 on your purchase using the coupon code: JSBlog10. Shop today! 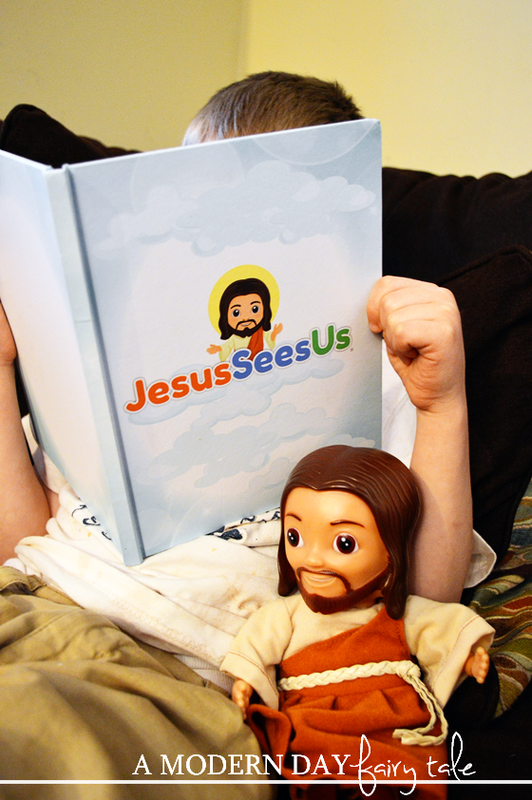 What little one in your life would love the Jesus Sees Us doll and book? 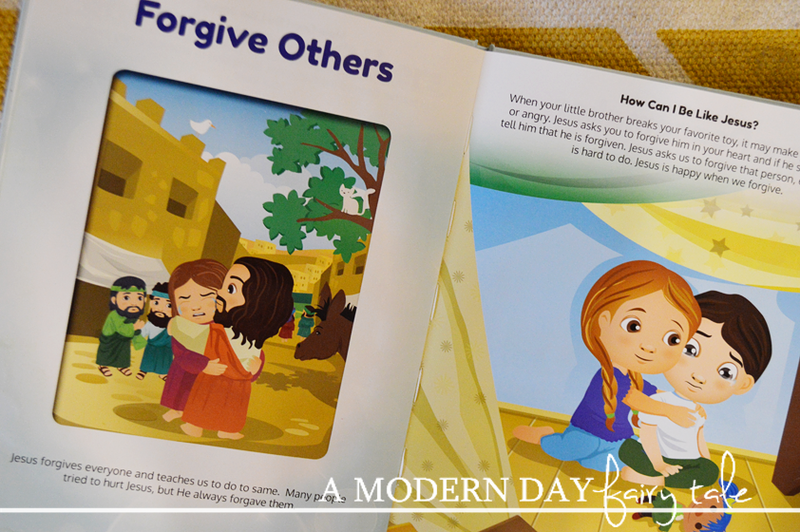 What other ways have you found to teach your little ones about Jesus? Such a cute book!! I love any book that comes with a companion!! The Jesus doll is so cute and would make a great buddy for any child! This would be a great book to get for my son since he's asking lots of questions right now. Another fascinating reality is that to advance smoothness, repetitive sound be sounds, for example, an air purifier, fan, or anything with a bring down volume. Then again, vacuum cleaner or hair blower pitches are better for babies since they lean toward sounds with a higher pitch.